Abraham Ribicoff was born in New Britain, Connecticut. He attended the University of Chicago, graduating in 1933 with a LL.B. degree. Mr. Ribicoff returned to Connecticut, where he was admitted to the State bar and went to work in the office a Hartford lawyer. 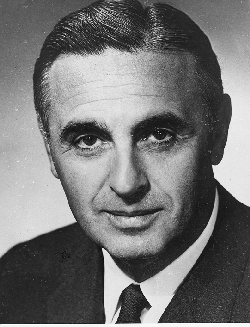 Beginning in 1938, Mr. Ribicoff served in various political positions, both at the local and State levels, eventually being elected Governor of Connecticut, a position he served in from 1955 to 1961. In 1961, President Kennedy appointed Mr. Ribicoff Secretary for the Department of Health, Education, and Welfare, a post he held until 1962.